Have you seen sap runs? In a joint effort to expand the knowledge and understanding of the flora and fauna of Polk County, Conserving Carolina and botanist David Campbell need your help in locating this month’s “Polk County’s Most Wanted—Habitat,” sap runs. Sap runs are a seldom noticed but fascinating micro-habitat. They occur on trees where an injury has resulted from some type of physical damage such as a broken limb, lightning, disease, etc. Sap runs are readily identified as dark streaks that occur on the surface bark of deciduous trees (in our area, most commonly on Oaks, Tulip Poplar, Basswood, Maple, and Beech, but by no means confined to these species). 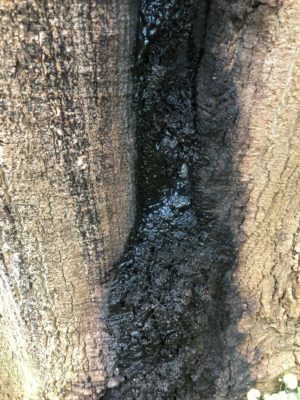 Sap flowing from the tree wound (known as flux) contains sugar which provides food for bacteria and other types of microorganisms. In turn, these microorganisms provide nourishment for the larvae of some of our most spectacular Hoverflies, incredible mimics of stinging wasps and bees. The fly larvae feed on the microorganisms that are suspended in the liquid sap, in much the same manner as marine organisms that feed on plankton. Interestingly, the larvae of the Hoverflies will ‘breathe’ through tubes in their abdomens while submerged, just like a snorkel. In addition to their beautiful appearance and behaviors, Hoverflies are critical pollinators of countless native plant species. 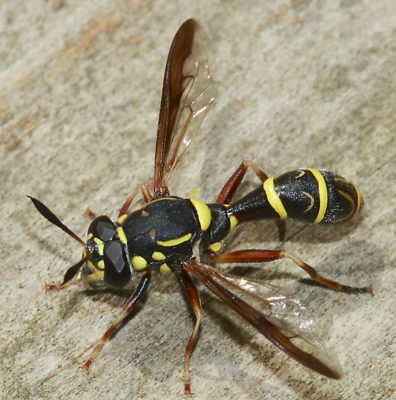 Other insects that frequent sap runs are butterflies, wasps, and beetles, all integral to the proper functioning of our ecosystems. Winter is a good time to look for sap runs on deciduous trees, as visibility is greatly enhanced by the lack of leaves. Trees with sap runs may be found anywhere, including your backyard, but most commonly they occur on large, mature trees. If you think that you have seen sap runs in Polk County, please send photos, questions, comments, and where possible, the GPS coordinates of the trees to Pam Torlina at Conserving Carolina by phone at 828-697-5777 ext. 300 or email pam@conservingcarolina.org, so we can document its occurrence in Polk County. In the spring, (with the permission of landowners) staff may undertake visits to trees to survey the types and numbers of invertebrates present. See more about “Polk County’s Most Wanted.” Download and print a “Pocket Guide” with all of the “Most Wanted” plants, animals, and habitats that you can be on the lookout for when you’re out in the field! Now available for download: “An Inventory of the Significant Natural Areas of Polk County, North Carolina,” a culmination of David Campbell’s seven years in the field documenting the rare and significant flora and fauna in Polk County.